29 December 2008, at 1:30p.m. US - A new field tool developed by Agricultural Research Service (ARS) scientists applies poultry litter to fields in shallow bands, reducing run-off of excess nutrients like phosphorus and nitrogen. Poultry litter — a combination of poultry manure and bedding material, such as pine shavings or peanut or rice hulls — is a natural fertilizer. The conventional method of applying it to fields utilizes a broadcast spreader, which scatters the litter across the soil surface. Because it rests on top of the soil, the litter is vulnerable to runoff in heavy rains. A new tool developed by ARS agricultural engineer, Thomas R. Way and his colleagues at the agency's National Soil Dynamics Laboratory in Auburn, Alabama, offers a solution. The tool digs shallow trenches about two to three inches deep in the soil. It then places the poultry litter in the trenches and covers it with soil. Burying the litter significantly reduces the risk of run-off. Designed to attach to a tractor, the litter applicator can dig four trenches as it is pulled through the field. Collaborators in six states have used Dr Way's litter applicator in their research, with positive results. In one project, Dr Way worked with Dan Pote, a soil scientist at the ARS Dale Bumpers Small Farms Research Center in Booneville, Arkansas. The scientists applied the litter to bermudagrass forage plots, and then watered the field with a rainfall simulator. When the litter was applied with Dr Way's new tool, phosphorus and nitrogen run-off were 80 to 95 per cent lower than when the litter was applied in the conventional manner. Dr Way has also collaborated with ARS scientists throughout the country to examine the tool's effectiveness with different crops. 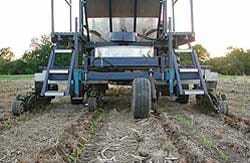 They used the new implement in experiments in corn fields in Alabama, Kentucky and Maryland; cotton fields in Mississippi and Georgia; and in bermudagrass and tall fescue stands in Alabama. Their results showed that the new tool has the potential to reduce water pollution significantly when used to apply poultry litter to a variety of crops. Now ARS is pursuing a patent and seeking companies to manufacture and market the litter applicator.